Yet another headline showing the sky high price that a house in London can sell for. This time it is a pre-fab ex-council bungalow in Peckham that has sold for nearly £1 million, despite having no bathroom and being unlived in since 2002. It's sold at nearly twice the average for the street, which is most unusual. Unusual because (1) it is so delapidated that it needs to be demolished and (2) it doesn't even have planning permission. But clearly the investor is planning flats (which can go for an average of £335k each - with current ones on the market being much higher) rather than a like-for-like house, which would see a profit made. Just the stamp duty alone, on this purchase, is £36,000. It's so ironic that in an age where we are seeing the gentrification of London, one of the main selling points of this Peckham location is its "village atmosphere". The one positive from this is that the council, who profited from the sale, pledges that they will reinvest it in the building of council homes, stating that they could not afford the required refurbishment. Cllr Richard Livingstone, cabinet member for housing at Southwark Council, said he was 'extremely pleased' with the sale of the shack bungalow. He said: 'We are investing hundreds of millions of pounds to not only improve our current housing stock - by making them warm, dry and safe and providing quality kitchens and Bathrooms - but also to build 11,000 new council homes across the borough. 'Although selling council homes is not something we would normally want to do, sometimes the costs for repairs and refurbishment to bring our older properties to a decent standard is simply too high. 'In these cases, we have the option to sell them when they become vacant and use the money to fund this housing investment programme. I have lived through three recessions and have a BA in Economics so am well versed in the boom bust cycle that normally occurs with property. The latter normally meaning that people end up with negative equity. If you add to that soaring interest rates, you end up with heartbroken families and lots of repossessions. It all gets very messy and has happened, as recently as the early 1990s. I don't foresee it this time though. Despite a presenter on LBC, just the other day, stating "the bubble has to burst sometime". There is something going on in London and it's multi-faceted and multi-layered. I also think it is deliberate as it is part of social engineering that's going on in London and some other major cities. Increased immigration means there are increasingly more people who CAN afford to live in London as they rent a room instead of a house/flat. Something that locals are less inclined (but not totally immune) to do. Increased immigration also means that there has been a cheap readily available workforce here, to build such things as the Olympics site, the changes in and around Kings Cross (of which there are many), Oxford Street, Bond Street and so on. In some cases, investors are probably paying for labour what they did in the 1980s. The recession has only helped to line their pockets further. Youth unemployment, student debt and lower wages mean that more and more young people choose to stay at home a decade or two longer. The housing benefit cap, has seen people moved to places as near as Harlow and as far as Hastings as their benefits can't sustain their lifestyle in London. Rather, the maths no longer stack up, to pay the rent. Also meaning those properties are freed up to appreciate in value further. Those people are then away from extended family and support networks. House inflation way over and above that of pay rises. Not only have pay rises been lower but since 2008 most people have been on a pay freeze - they didn't just eliminate the merit pay rises they even eliminated the "cost of living" ones that were meant to help us keep pace with fuel rises or rises in the cost of London Transport etc... When I consider that my Grandparents' generation could buy a house on one salary, my parents' generation could buy a house on two salaries, and now all people can afford (in London), if at all, is a flat, it is easy to see that there has been a shift. Also those parents and grandparents weren't even on great salaries - they were just middle management level. 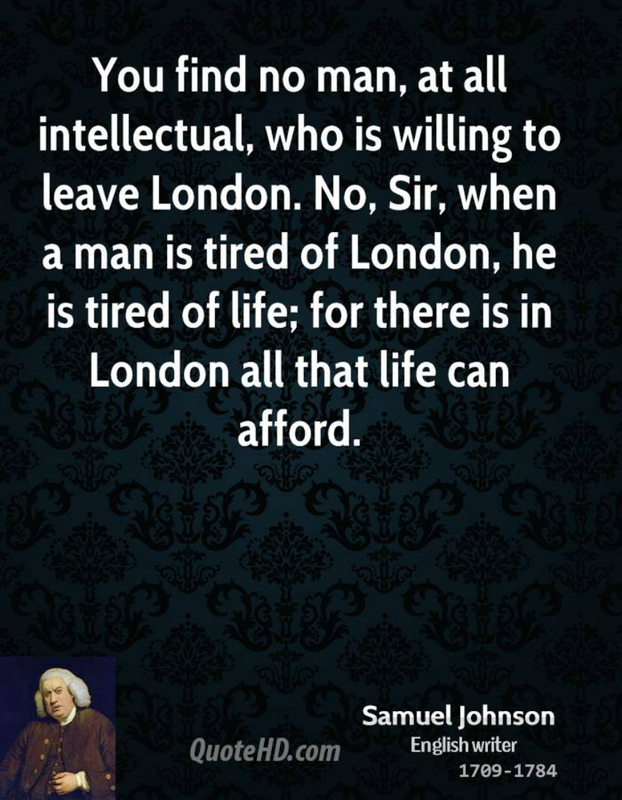 Now, London is the domain of Doctors, Lawyers, Engineers etc... and even they are finding they have limited choices when picking an area in London in which to buy and live. All of this is meaning that each year sees more and more people leaving London, in favour of other towns and cities that are affordable. Culture of Flip It. Forgive me here but I watch Homes Under The Hammer everyday. It's a whole new career/industry to buy a flat/house at auction, decorate it in anything from 4 weeks to a year and sell it at great profit. This has become so common it is a FABULOUS way of getting all of the old housing stock up to scratch in terms of rennovations that the average person may not be capable of, but it is adding to the spiralling increases in house prices. It also means the entrepreneur rather than the new owner benefits from that housing equity withdrawal. Economics taught me that capitalism is fine, as it is regulated by supply and demand. When people can no longer afford for something to go up in price the market will regulate those price increases. Except that's not happening. A lot of places are bought off plan, overseas. Meaning that even when the local population can no longer afford the prices, there is still a captive audience willing to pay. "In a spending spree that started in 2008, the ruling Al Thani family [Qatari royal family] and its assorted investment vehicles, including the Qatar Investment Fund, have acquired a 20% slice of Camden market; [all of] posh department store Harrods; 95% of the Shard, at 87 storeys the EU’s tallest building; the Olympic village; half of the world’s most expensive apartment block at One Hyde Park; the Chelsea Barracks site, and the US embassy building in Grosvenor Square". Can you dear reader, afford to buy where you live? Or, are you in a flat when you'd rather be in a house? Or does the size of your home dictate you are having fewer children than you would ideally like? I think this infographic of the UK's most expensive neighbourhoods clearly shows the dearest and most sought after prestigious parts of London. "The list is [nearly] entirely made up of London locations, with neighbourhoods in Kent and Hertfordshire missing out, whilst the quiet commuter town of Virginia Water, Surrey is the only area outside London which makes the list. The birthplace of the Ryder Cup, Virginia Water is the seventh most expensive area to buy in the UK with prices just short of £1million, yet even this town is still only a few miles from London’s international airport, Heathrow". When I graduated, the general rule was that a mortgage should be no greater than 3 times your salary. It was good maths to live by, as it was meant to also translate into your spending only a third of your income on your home, leaving you with a comfortable disposable income for you to weather most storms. Meaning no spiralling credit card debt... but sadly, sometimes it is credit cards that get people through the second half of the month. Or for those less fortunate, food banks or pay day loans. Unfortunately our want want want culture has seen people eat into this disposable income by buying bigger and bigger homes. Buying two instead of 1 car(s). With the advent of mobile phone contracts and TV subscription contracts, disposable income is increasingly squeezed for most. I think we now live in a culture where people could cope even less with soaring interest rates than they did in the 1990s. Just look at that infographic, you'd have to be on £300k a year to get your foot in the door. So where does this leave the average Londoner? Well, The Telegraph seems to have their finger on the pulse with the answer to that question, stating that "London to become a place that we work but don't live". I'm wondering, does the establishment want London to be like other European cities, where the workforce only ever rents and never buys. In Spain it is most unusual to buy your own home. In Germany and France, a higher percentage of people rent versus the UK. I would like to see how this story pans out. On average the cost of a London home has risen 44% over the past 7 years. I know of many people relocating well beyond London, where once the only move required was to Greater London, so this is a real life phenomenon and not just a thing of headlines. In fact my fellow blogger Ruth at Rock 'n' Roller Baby is about to make just such a move. As is often the case, London means flat and a move means house. What's not to love? It's fine unless like Ruth you come from the philosophy of "if you've tired of London you've tired of life" and she hasn't. She hasn't at all. The famous quote I refer to is below. But often a life outside of London brings a much greater quality of life. All is not lost, at all. In fact there are whole websites dedicated to a life after London. Do you have any knowledge of soaring London house prices or has it effected your life? I'd love to hear your comments and for you to enlighten me further on where we the UK and the London workforce go from here? This article has partly answered one of my big questions about the property prices in London. I've already seen teachers turn down jobs in London because they can't find a suitable and affordable family home near the school. How sad that teachers cannot be part of the communities they teach in but must comute in from poorer areas. In many schools the teachers are all wives of doctors, laywers, etc or young enough to still live at home. Our boys will not get the good role model of a male teacher in primary school. So my question was where will the wealthy Londoners find nurses, shop assistants, cleaners, and other lower paid but essential workers? The answer of them coming in by train was unsatisfactory because of the price of public transport and you can be a cashier or a cleaner in Hastings - why bother to come up to London? Immigrants renting rooms is part of the solution. So will all the lower paid jobs in London be taken up by immigrants, wealthy housewives, and singles who still live at home? I suppose there will always be a supply of these people. Another question. There are loads of small semis built in the 1950s which line the more modest suburbs in e.g. Harrow (there are other boroughs but I know Harrow so I'm thinking of Queensbury, Belmont, Harrowweald, Kenton, etc...). These houses have been extended and done up to their limits but they don't have the appeal of the older pre-war houses in e.g. Barnet and Brent which have bigger proportions and can be split into up to 3 small flats if you use the roof area. So will the wealthier professionals want to pay up to a million pounds to live in these places? Or will they become more gentrified in some way so as to make them more desirable? Or wil it be a case of no other choice? Or will these be the places that end up being rented out by the room? One last thought. The BBC's move to Manchester seems to have been a bit of a failure as they seem to be very much still in London. I would like to see other big cities trying to compete with London in terms of big companies, entertainment, tourist attractions, etc... I know other cities have all these things but they are not seen as viable alternatives. In the US every state has a big city that offers everything. In Australia you can live Sydney, Melbourne or Perth and expect everything. Why is the UK so London-centric? Why are Machester, Brum, Cardiff, Leeds, Newcastle..... so second class? We have so many fantastic cities but none of them have the allure of London even thought hey have the history and the infrastructure. Sorry, I went a bit crazy here but you struck a chord. I'd read recently that since the coalition came to power that the majority of new builds had been bought on buy to let mortgages rather than by owner occupiers. This is the first time this has happened since records have been kept. Then there is this Guardian article, http://www.theguardian.com/uk-news/2015/jan/25/its-like-a-ghost-town-lights-go-out-as-foreign-owners-desert-london-homes about overseas speculators buying up huge swathes of central London and not even bothering to rent it out. The new right to buy has been rightly condemned, after all since 2012, for every 3 social homes sold, only one has even been started (let alone finished). Historically as a country we've been a little unusual in Europe in terms of home ownership, rental is far more common in Europe than it traditionally has been here. Europe has far better regulation on the rental sector than we do.